The Coronado Shores is a condo development south of the village and includes 10 buildings, each with views of either Glorietta Bay or the pacific ocean. The condominiums in the buildings range from small studio apartments to 3 bedroom units with up to 2,000 square feet of living space. In addition to the buildings that make up the shores, the development also offers its residents 8 tennis courts and 4 pools. Over the years, residents have upgraded their condominiums to reflect their personalities and so when looking at purchasing real estate at the shores, you can find many different floorplans and design elements. Although the shores are not for everyone moving to Coronado, it has been a popular development for empty nesters and buyers looking for a second home in the Crown City. 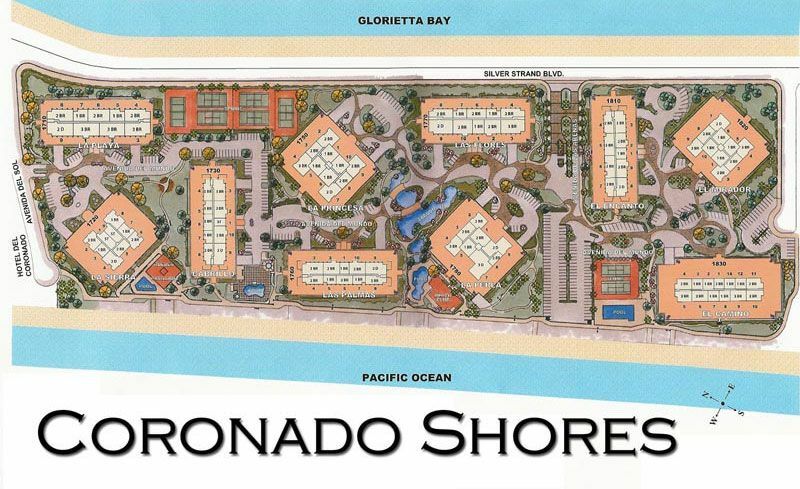 To see a layout of the development, click Map tab to see the Coronado Shores Map.